The pinhole camera, which is the prototype of the modern camera, is a camera obscura with photographic film instead of a viewing screen. Light enters a dark box through a small aperture, the hole. An image is formed on the film, the sharpness of which sensitively depends on the size of the aperture at a given distance to the image plane, i.e. 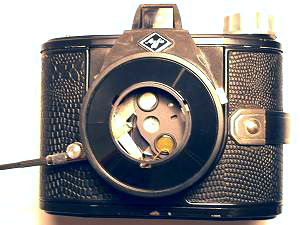 the focal length of the camera. Numerous different equations for the optimum pinhole size have been published. Unfortunately, these equations differ by remarkable factors. Sometimes numerical formulae are given which turn out to be useless, since they are presented without noting for which unit system (metric, imperial,...) the numerical factors have been calculated. In the following you find a short derivation of an equation for the optimum hole size in dependence of the focal length of the camera. A) Geometry. 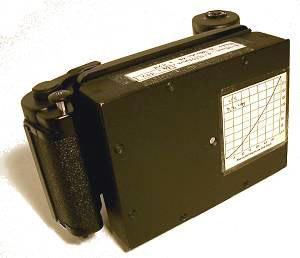 Each point of an object to be imaged should produce as as small as possible point on the film plate. This can be reached by confining the bundle of light rays coming from an object point by a small aperture. Thus, for a sharp image, from a purely geometric point of view, the hole should be as small as possible. B) Diffraction. On the other hand, if the hole size becomes smaller, diffraction effects increasingly play a role. Diffraction at the small aperture leads to a broadening of each image point, which provides a physical limit of the maximum image sharpness. 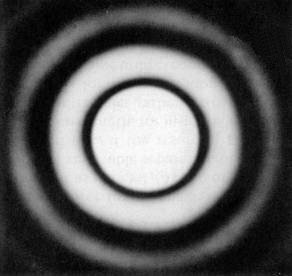 For a circular hole, the Fraunhofer diffraction pattern (left figure) is given by an Airy function (right figure). Most of the intensity is contained within the central maximum. This equation only differs by a minor numerical factor from the expression obtained by using the full theory of Fresnel diffraction by L.A. Turner in 1940 . Inserting a value of 550 nm for the light wavelength, a value which is in the middle of the visible spectrum, we obtain a numerical equation for practical purposes in metric units. 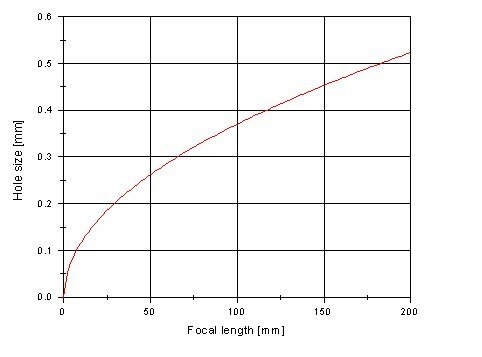 Entering the focal length in millimeters this equation gives you the optimum hole size in millimeters. For your convenience, you find the corresponding graph and a calculator, which you can use for optimum-hole-size determination according to this equation. The calculator additionally gives you the f/number of the camera, which you will need for the exposure-time determination. The exposure time is calculated taking into account two aspects. Firstly, the nominal time according to light metering for the given f/number of the camera is determined. Since, due to the small apertures of a pinholel camera, this usually yields rather long times such as several seconds or even minutes, it is necessary to correct for the Schwarzschild effect. A) Measurement: Exposure meters do not have f/number scales up to values higher than something like f/32 or so. Correspondingly timescales usually go up to some seconds. Thus, you have to expand your scales into these extreme ranges manually. A simple solution works like this: Produce two strips (e.g. of paper or cardboard) containing an extension of the f/number and time scales respectively. You can find appropriate combinations on the right side of the scale. 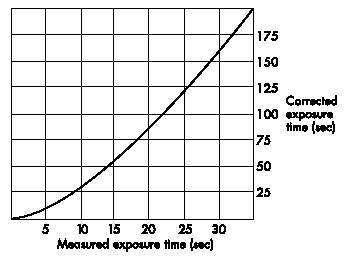 If your camera has a f/number of f/176, then the resulting exposure time is 8 seconds. Most probably, the f/number of your camera is somewhere between the numbers on the scale. Then use the next higher number, except if the number is very close to the next smaller number, which in that case should be used. Alternatively, you can calculate the exposure time, referring to a reference value which is on the scale of your exposure meter, e.g. f/16. If you use smaller apertures the f/numbers decrease by a factor of Sqrt(2) per step, which leads to an increase of the exposure time by a factor of 2.
where to is the time corresponding to the reference f/number fo. Note that you have to do this calculation just one time for each camera. Once you have calculated 2^n you only have to multiply the measured exposure time at the reference f/# with the constant factor. 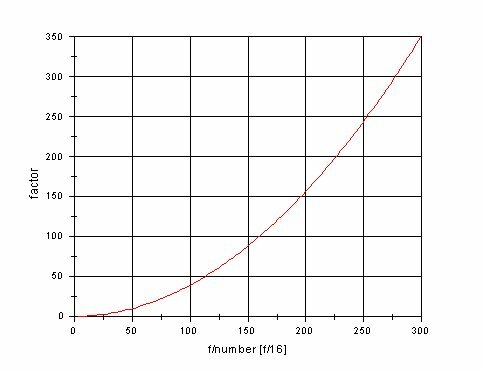 In the following graph, the factor is given as a function of the f/# of the camera using f/16 as reference value. It thus gives the factors the exposure time measured for f/16 has to be multiplied with. B) Schwarzschild correction: The such determined exposure time, which in the following will be referred to as measured exposure time, has to be corrected by another factor due to reciprocity failure of the film at exposure times above some seconds (Schwarzschild effect). This correction is done via an experimental curve specific for the film used. 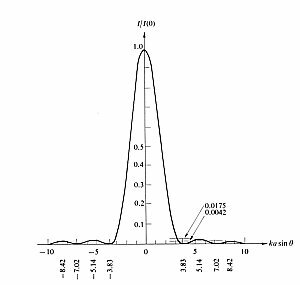 The curve shown below is the one determined and published by Ilford. It holds for the following film types: HP5, FP4, Delta 100, Delta 400. For other films please refer to the specifications given by the manufacturer. The criteria for a "good hole" are the following. (1) The hole should have the right size with respect to the focal length of the camera and, much less important, to the object distance. This point has been treated extensively in the first paragraph. (2) The hole should have a properly circular shape and (3) it should be flat, it should not show a grout at its edges. (1) and (2) are highly important factors directly affecting the quality of the image. A hole having frayed edges leads to a strange frayed outer limit of the image. A non-flat hole usually results in a higher effective thickness of the foil used and therefore leads to vignetting of the image. These factors can be accounted for using the right hole-manufacturing technique. Two techniques, wich both, whith some practice and careful work, potentially leading to good results will be described in the following. Use thick aluminum foil. Different thicknesses can be purchased. Kitchen-alumina foil for cooking and conserving purposes usually is too thin and is less suited for hole making. Flatten an approximately 2 cm x 2 cm portion of the foil by rubbing in with the back of your fingernail on a flat support. Put the foil on a stack of two or three soft rather soft pieces of paper on a hard support. Coffee filter cutouts will do a good job. Stab a small hole using a sharp pin, putting it through the aluminum foil and the stack of papers. As you will see, the thickness of the stack of papers determines the penetration depth of the pin and therewith the diameter of the hole. Varying the number of papers in the stack can consequently be used to obtain the desired hole size. The resulting hole is not flat - its edges are bent towards the papers. Flatten it very carefully by using fine grained grinding paper. The hole will now be smaller and its shape is not round anymore. (Check under a microscope or a strong magnification glass). Put the foil back on the stack of papers and repeat stabbing. Repeat checking the hole size and shape and stabbing iteratively until the result is satisfactory. This technique will with some practice lead to pleasing results. The drawback is that the holes are very sensitive. You should not touch them and even protect them agains stronger winds. (Even take care if you want to blow dust or dirt away!). The advantage is, that if you take care of the flatness of the edges of the hole, you will not have problems with vignetting. The image field will be large, which is particularly important when using small focal lenghts. You can get suitable pieces (approx. 2 cm x 2 cm) by cutting a food can into pieces. The cap or bottom gives flat pieces of sufficient size. Begin drilling a hole using a drill of about 2 mm in diameter. Do not proceed to puncture of the plate. Stop when you see a small bump appearing on the bottom side of the plate. This treatment gives you a small cone in the plate, which is necessary to avoid vignetting. Carefully grind off the small bump on the bottom of the plate using fine grained grinding paper. The result should be a flat plate with a cone in it and without a hole. Use a sharp pin to make a hole in the deepest point of the cone carefully. Check the hole size and shape using a microscope or a strong magnification glass. Repeat stabbing until the hole size and shape are ok. This technique needs some practice but the result is a very round and flat hole of high stability. The size can be adjusted perfectly. 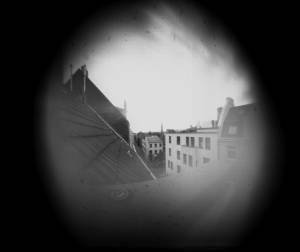 This image shows a partly self made 6 x 9 camera with a very short focal length of 49 mm. The front part is a wooden box with an aluminum front plate, the interior of which is carefully covered with light absorbing felt and matte black paint. It is attached to a mamiya film casette which contains all mechanics. There is no shutter. For pinhole cameras large negative formats should be preferred in order to keep the magnification factors during printing low. On the front you can see the Schwarzschild diagram for my preferred film. I have glued it there to have it always with me. Some other notes (e.g. the correction factor and the f/# value for the camera) which are required for the calculation of the exposure time are seen on the top. 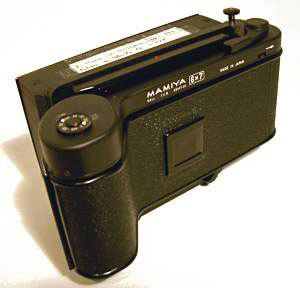 The mamiya film casette. It is not so easy to build a reliable film transport mechanism by yourself, so it is better to resort to commercial solutions. The disadvantage of this particular setup is its weight. 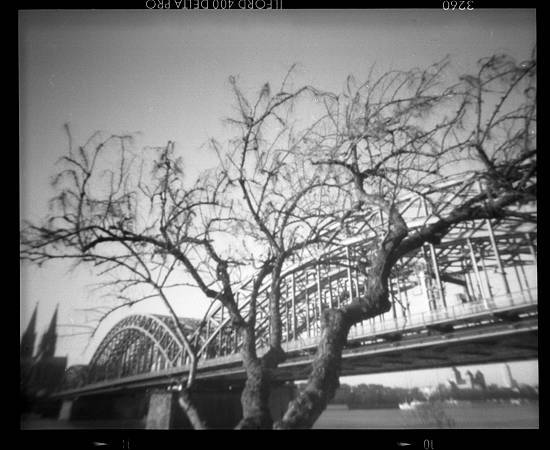 Keep in mind, for pinhole photography you usually have to carry a tripod as well. I have amputated the lens (and some of its mount) and placed a hole of appropriate size behind the aperture carrier (in order to reduce the focal length somewhat more). This even allows for the use of the built in yellow filter, which can be swept in front of the hole by means of the handle on the right. 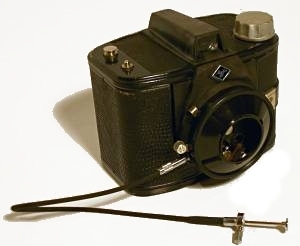 The shutter mechanism of the Agfa Clack (in contrast to the 6 x 6 model "Click") has a "B" setting and a cable release can be attached, which makes it usable for pinhole photography. Fig. 1: The pinhole was made using Aluminum foil just by stabbing a hole with a pin. No particular care was taken for making the hole round or flatten the edges. As you see this leads to a significant amount of vignetting, and the border of the image is showing the uneven shape of the hole. 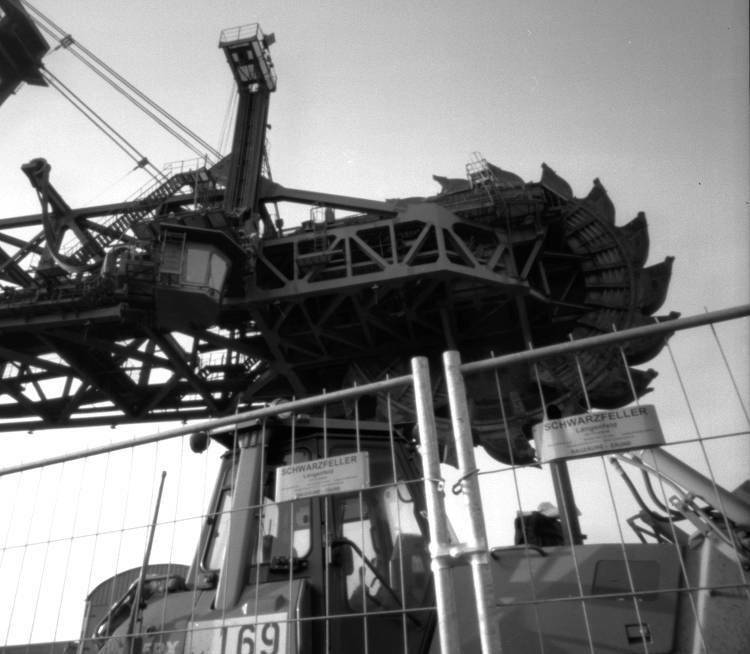 The focal length of the camera was about 25 mm and I used a 5 x 10 cm plate. Without vignetting this setup would give an extreme wide angle. The hole size however seems to be quite well chosen - the image is sharp. Fig. 2: The pinhole used was made from Aluminum foil here as well. However, in this example I took much care of avoiding non flat borders of the hole. As you see there is much less vignetting, but you can still see that the corners are a little darker. The hole size was chosen too small (with respect to the above considerations) by a factor of 2. Thus, diffraction effects come into play and limit the sharpness of the image. Fig. 3: The pinhole was made using a thin metal plate and its size was chosen according to the above calculation in this example. 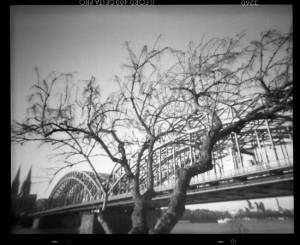 There is no vignetting even in the very corners of the negative ( 6 x 7 cm). Furthermore the image is very sharp. Have a look at the signs in the foreground (click the image to see a larger version), you can read part of them! E. Hecht and A. Zajac: Optics. Addison Wesley, 1974. L.A. Turner, Am. J. of Physics 8, 1940, 112.